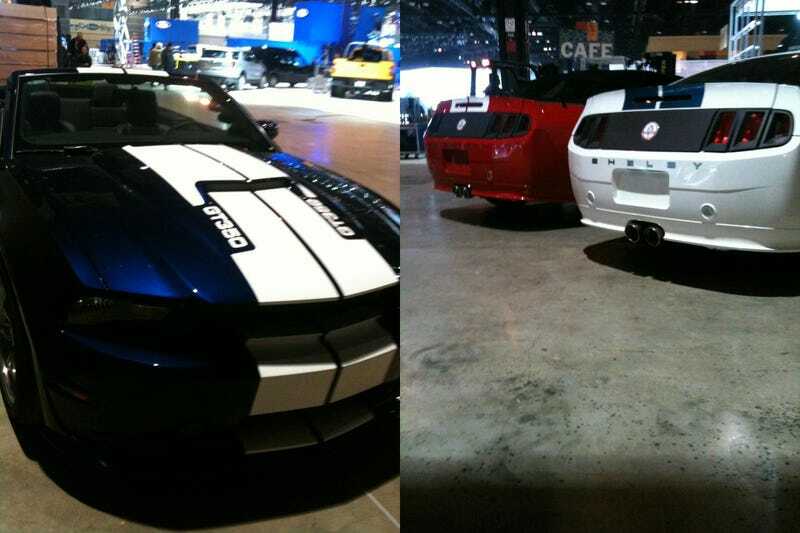 Someone working setup for the GM display at this week's Chicago Auto Show managed to snag a few images of the heretofore unseen 2012 Shelby GT350. Though the GT350 appears to be hanging out near the Ford booth, this introduction will actually mark the first time Shelby's unveiled a vehicle on their own at an auto show. If it's anything like the current Shelby GT350, you're learning more by seeing it than by hearing the stats. Unlike the GT500, the GT350's mostly an expensive (like $30K+) bodykit, supercharger, and a few other tweaks you could find cheaper elsewhere but not with the Shelby certificate people wear in the same way your uncle still clings to his Member's Only jacket.